This page will cover notable expansions made to the grounds from year to year, all the way back to when Castle Park was first built. Castle Park opens at Sleepy Hollow Sports Park on September 2nd, 2006! A new home for the Faire is finally ready. There was construction equipment still moving around the site mere minutes before the guests were let in! Severe raining proved that the new home had some drainage issues, but also proved that regatta boat races were possible in front of the royal food court area. The Potter’s House has newly themed lower panels. Amos Fabulous Foods “Chinese” location has doors and lower panels (replacing opening year nut shop). 8/19: K’s Bake Shoppe has a new patio bricks, and new sod has been set between the Bake Shoppe and Off With Your Bread next door. New merchant buildings. Four new merchant shops are under construction for 2007. They are located at the end of “Dragon Way” (the path to the right at the end of main street). The shops are located between Dragon Mine and Sir David’s Wild Game near the corn maze area. New fencing. A wall now separates the Sherwood Forest and Pirate’s Cove area. New fencing has been installed along the walk between the bridge and the ticket entrance area. 8/19: Children’s Stage. A new stage set is being constructed. Dungeon Tour expansion added to the corner of Marrick Castle. King Oberon’s Faery Realm treehouse. Treehouse. King Oberon’s Treehouse added at far corner of the park, expanding the Children’s Realm. Shade. More canopies over stage areas (Children’s, Minstrel) added, along with a few pieces of garden furniture to relax on. Dorlamagne’s Living Treehouse. Expansive landscaping behind one of the new South end shops. Walk through and take a look! Massive flooding affects the entire area, from close to the Sleepy Hollow lodge all the way to Festival Park, but Sleepy Hollow’s cleanup crew quickly got the park in to shape better than ever! Even more Landscaping. Throughout Festival Park, our landscaping group has been planting trees, flower beds and grass. New “living tree” gazebo structure on High Street. A new winery joined us, taking over the former tavern location (aka, Saucy Wench Tavern). The former Viking Pavillion becomes the new home of the expanded Saucy Wench Tavern with expanded bar and new decorations, including “port holes” that could be opened to let in extra air and light. The torture chamber tour once again receives more minor show updates. With new management and a new name (The Renaissance Faire at Sleepy Hollow) the winds of change have swept the faire grounds! No longer is the English Castle alone in its singular power: Though it still anchors the north, it has new rivals vying for the favors of faire-goers! The Scots have invaded the south—and they’ve built a castle! 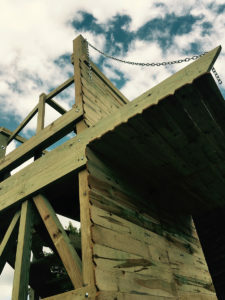 Constructed for the 2016 season, this exciting feature adds new drama to the Renaissance Faire at Sleepy Hollow. Featuring a large stage and flushable privies, the Scottish Castle offers Highland games, bagpipers, sheep—and plenty of intrigue! A Gypsy caravan troupe has infiltrated the southeast. Beware the seductions of the nubile dancers on their stage! La! A small contingency of the French are staking claim to one corner in the south, not far from the Scots. Turmoil ensues! Ooh la la! And lastly, cries of “Valhalla!” echo down by the river! It seems a Viking horde has landed on the shores as well. . . . In 2017 the Sleepy Hollow staff worked hard to bring in some exciting new acts as well as incremental changes to the site. A new stage was added to the South Glen. Initially, we used it for an experimental Dirty Laundry show but eventually settled on calling it the highland stage and the home of our troupe of Scotts. Many of the existing buildings received a badly needed facelift. Freshly stained wood and brightly painted gypsy wagons could be seen all over the grounds. The docks in front of the Dark Horizon pirate stage expanded greatly. A multilevel stage perfect for dynamic sword fights is now a feature of pirates cove plus new seating and a paint job for the ship itself. Battle Chess was a new performance added in 2017, an audience participation show with a mix of stage combat and boffer weapons in the hands of audience members. As part of the set, a huge siege tower was built to oversee the battle. For the first time in years, we changed up the weekend themes, making Labor Day weekend Vikings & Shieldmaidens Weekend with 3 separate Viking encampments populating the village and performed combat demonstrations.